The Carpenter Bee is an occasional pest in Hemet, Murrieta, Temecula and surrounding West Riverside county areas. Carpenter bees are considered wood destroying organisims by the state of California, and require similar treatments as other wood destroying species of pests, such as termites and carpenter ants. 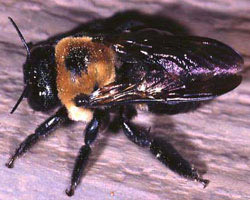 To control carpenter bees, AmeriGuard Pest Defense uses low toxicity, non-repellent chemicals. In comparison to traditional pesticides, non-repellent treatments represent a major leap forward in control. Carpenter bees come into contact with the treatment, eradicateing the active bees as well as their larva. Most Carpenter bee services require a quick inspection of the Carpenter bee infestation before a recommendation for treatment can be given. The inspector will advise you on the spot of the type of recommended treatment to eradicate the Carpenter bees from your structure. We can then schedule your Carpenter bee service immediately. Every AmeriGuard Pest Defense service begins with a licensed technician providing a full inspection of your residence and property. During the inspection, the service technician will identify potential problem areas around the structure of your home or office. After the source of the Carpenter bee problem has been located, your technician will point out other potential Carpenter bee harborages. Your technician will create a customized bee treatment service to effectively rid your home of Carpenter bees.